Two outs in the bottom of the ninth inning. Game Seven of the World Series. The opponent’s ace throws me a heater. I murder it! The crowd goes bonkers as I win the championship for the Kansas City Royals. After celebrating, I fetch the wiffle ball from the other side of the house, and I set up to win it all over again. If each of these imagined championships of my boyhood had earned a real flag, my mom’s house would have looked like the United Nations. I let go of that dream a long time ago. I was not skilled enough to be a world-class baseball player. Or, more honestly, I was unwilling to put in the time to find out whether or not I was good enough. I built fresh dreams atop my fantasy of baseball stardom. Write a weekly column. Write great novels. Write anything else I damn well pleased, but write it effectively and maybe even change the world with it. Those who really and truly push themselves know how much effort goes into spinning hay into gold. The Royals’ left fielder, Alex Gordon, spins that gold into platinum. He dedicates himself to baseball at a level I wish I would offer to my writing. Others have written stories about the one time Gordon broke his dietary regimen to eat a hamburger, and about how coaches think even his bathroom schedule is prescribed. His dedication transformed him from a top-prospect bust to one of the silent stars of our era. Last week, he lived my old dream. His Royals were down 3-2 in Game Seven of the World Series. Two out, bottom of the ninth inning. Gordon faced the Giants’ best pitcher—a pitcher on the threshold of legend. 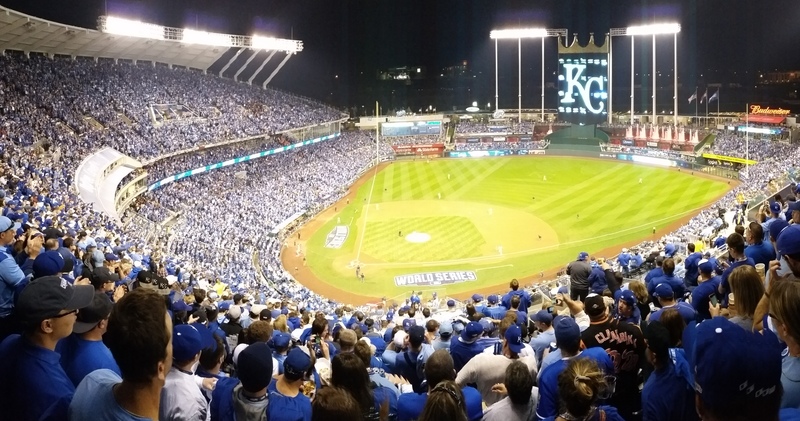 That the Royals would play in the playoffs, let alone on this stage, boggled the oddsmakers. The Royals were mediocre at best in July. They had no standout star. Not even Gordon, whose biggest, most reliable successes are on defense, which fans and analysts both overlook. Then, to lean on a cliché, something clicked. So much of the team stood out in overlooked ways that people started looking. The Royals turned scrappy and resourceful. They figured out what they do best, and they played that way, even when it went against current baseball conventions. A bunch of guys having fun suddenly plaused the implausible. They earned the team’s first playoff berth in 29 years. They won the Wild Card game after their win probability was literally three percent in the eighth inning. They won seven more straight to reach the World Series. Forget pigs flying and hell shivering. Anything was possible. I started writing a humorous weekly column and secured a publication pleased to run it. One solid accomplishment. Another piece of ether made tangible. Then, with Alex Gordon at the plate, the whole magical season reached its final out. No one on base, down by one run. The first pitch was a strike. The most finessed storyteller could not craft a more perfect way to play out this postseason. All the seeming restrictions of life frayed and fell away, turning reality beautiful and glorious and completely ridiculous. The second pitch, Gordon swatted into center field. The ball touched the grass. A two-out single. The slimmest deli slice of hope. The center fielder missed the ball. It skittered to the wall. Gordon sped up for second base. The left fielder bumbled the ball against the wall, buying a couple seconds more valuable than a lifetime of fandom. Gordon ran for third base. The left fielder corralled the ball and threw it to the shortstop. The Royals’ third base coach read the tea leaves in an instant—Gordon’s speed, the shortstop’s arm strength, the distance of the looming throw—and he hoisted his hands. He wanted Gordon to stop. What do you do? You work hard for years for one goal: maybe a World Series ring, maybe a novel. If you’re very fortunate, the universe sets up the grand opportunity, or a whole Rube Goldberg of opportunities, just for you. Then, the universe does what it does best. It pulls back its hand, takes a step into the shadows, and lets your own actions determine the finale. Comedies and tragedies are the exact same stories until this final beat. Everyone ends up married, or everyone ends up dead. You live forever, or you disappear. In these big moments, you get one or the other. There is no compromise. Alex Gordon listened. He stopped at third base. The next batter popped out in foul territory. Game over. The third base coach made a rational call, and Alex Gordon very defensibly trusted him. He put hope on a respirator for one more batter. He put his faith in his teammate to hit another baseball even though, win or lose, his dash would have been pantheonized. Probably nine times out of ten, he’s out. But one time out of ten, he lives forever. Listening to the base coach is the smart choice, every time. I survive by listening to the conventional wisdom of my inner base coaches. Play it safe. Don’t throw away your chances. Never make the final out on the basepaths. Game Sevens are not conventional. Big moments are never safe. When an entire lifetime of striving is on the line, hope has no value. The universe will not hand you victory. You go for it, or you sit on your heels. 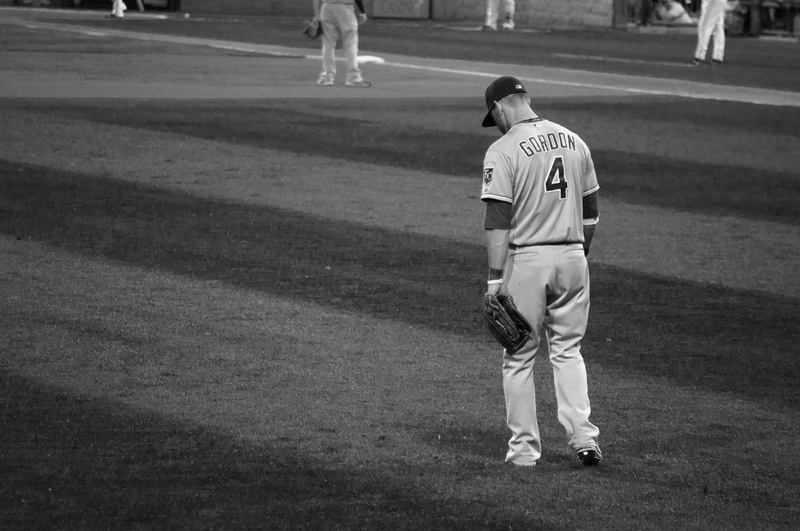 For all my emotional investment, for all I didn’t sleep that night, I am 0% pissed that Gordon did not run home. But I still play out a fabricated memory of his running home, over and over and over. Even when he’s out by a mile, I am proud of him. This year’s Royals team showed me the value of fun, and amazement, and wonder, and dedication, and a fair bit of bravado. The season is over, and they continue to inspire me. They didn’t win the championship, but that doesn’t mean I can’t. Here I am, rounding second once again. But when I get to third this time, I’m blasting past the base coach. I may get thrown out by 25 feet and silence the stadium. Analysts may pick apart my boneheaded decision. But I don’t care. I’m through living for hope. The dash for home is the play I want on my highlight reel. Safe or out, there’s always next year. This piece appeared in full in The Durango Telegraph.